Japan is one country in Asia I have not been to yet eventhough my Filipino-Japanese loveones have been calling Japan "home" for decades. For years they have been inviting me to come and visit. They have regaled me with stories of fun drunken nights at many izakaya in their hometown of Nagoya. An izakaya is a type of Japanese drinking establishment which also serves food to accompany the drinks. They are popular, casual places for after-work drinking. Despite my very limited experience with authentic izakaya, B-Dama gave me a sense that it is the real thing. The chefs are Japanese. Being housed in a newly built commercial building does not diminish its feel of authenticity. As soon as you walk in you will be facing a "messy" kitchen where the grilling is being done. A step down is a the tiny dining room with sushi counter that seats about 10. Dining tables are tightly packed. B-Dama is how I imagine the izakaya in Japan to be like--casual, unpretentious, homey and relaxed. Little hand-made cutout menus are pinned on the wall in addition to separate grill, sushi, soup and drink menus at the table. Even the sign was crudely spelled and pasted on the glass window. Honestly, Enrique and I felt "lost" while perusing the menu. 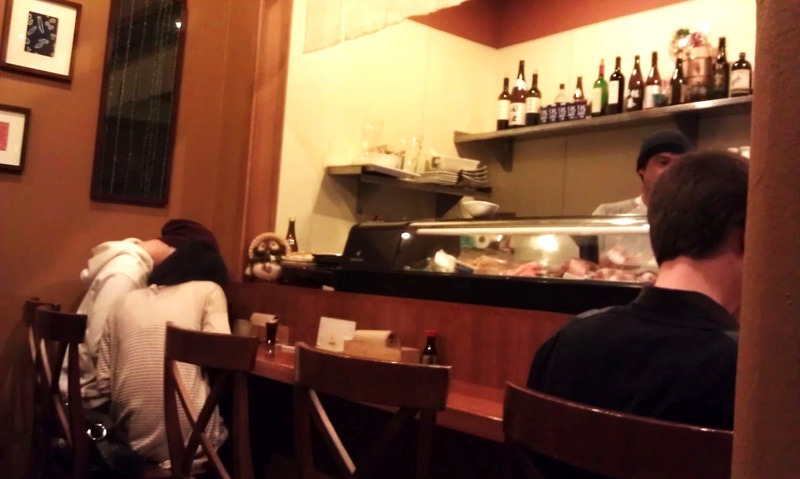 This is not a typical sushi place which we can navigate without having to look at the menu. I am more familiar with the concept of izakaya than Enrique so I took care of ordering the yakitori (grilled items). Most of these grilled items can be ordered prepared with sauce or salted. He took care of the sushi/sashimi part. *Very nice and flavorful. Slightly chewy but tasty. The beef and quail complimented each other texture-wise. *I tried one and it was fresh, not chewy and with just the right amount of gaminess. However, now I remember that I really do not like chicken heart even when I used to eat them as street food when I was a kid in the Philippines. *3 fresh shrimp with shell and head still attached. You bet I ate the whole thing--head, shell and "feet" and all! *Enrique was slightly disappointed because he said it was mostly veggies with some seafood. I tasted what seemed to be "fake" crab leg. It was good but I was really there for the yakitori. TARA NABE (Black Cod Soup) $12: Arrived in a traditional cast iron pot, this soup was one of the best fish soups I have ever had in a while. The soup came with generous slices of very fresh black cod, tofu and veggies. The broth was not salty at all. I did not suffer from temporary dehydration whenever I eat MSG-laden Asian soups. This soup at B-Dama was so delicate and divine. The pot looked small compared to the big bowls of ramen we are used to but it was more than enough to truly satisfy me for the evening. A wonderful soup that I will definitely get again and again! SASHIMI PLATE $17: Enrique was still slightly hungry (Surprise! Surprise!) and decided to order a sashimi plate. It came with about 10 pieces of assorted fish. We did not pay attention to what kind they were but we recognized tuna, salmon, halibut, etc. They were fresh but not melt in your mouth sashimi that I have experienced at other Japanese restaurants before. It came with a pile of grated radish which speaks to the authentic presentation of a traditional sashimi. TAKO SUSHI $4.5: This is how we test the freshness of the sushi at a Japanese restaurant. We order tako or tuna sushi. The tako has to taste fresh, not rubbery or previously frozen. B-Dama's was definitely the fresh kind! CHECK: $65 including tax before tip and 1 Japanese soda. I love the casual, non-pretentious vibe of B-Dama while feasting on delicious small grilled dishes. It is a fun place to bring your friends and order everything on the menu. Overall quality is remarkably high. The black cod soup was exceptional. Even the green tea (another factor I used in judging the quality of a Japanese restaurant) was very nice--not bitter and appropriately hot. Service was friendly but hurried. We absolutely loved our server that Enrique tipped generously. She was nice and very attentive. Be ready to patiently wait for drink refills as the staff are very busy. Now that we are familiar with the menu, we will have a better time navigating and enjoying the dishes. B-Dama is a neighborhood gem. Enrique and I took advantage of the beautiful evening to walk here from our home. 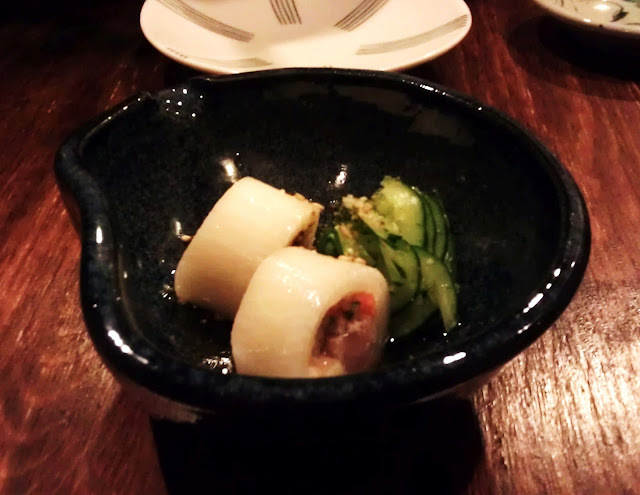 A sense of adventure is a big part of izakaya dining. 1. B-Dama tends to get packed. Get a reservation. 2. Prices of yakitori are reasonable between $2.5 to $3.5 each small plate.